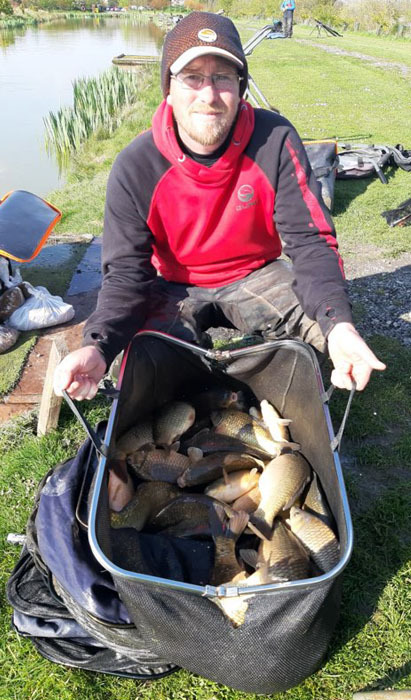 The second qualifier of the 2019 Match This series saw ninety (90) anglers make their way to Partridge Lakes near Warrington. The venue had suffered bitingly cold easterly winds and overnight frosts all week, including the night before the event. Expectations going into this latest qualifier, therefore, were low with many anglers preparing themselves for a harder than normal days fishing. However, come the day of the match, the weather was significantly different than that which had been experienced during the week with a cloudless sky and bright sunshine seeing temperatures rise to 15 degrees during the later stages. Winner of the match was Tricast / Guru / Blake Baits backed angler Andy Bennett, who is no stranger to the venue drew peg 113 on Covey 5, which was the same lake and bank where he had recently held a coaching session at the venue during the week leading up to the match. Andy started his match fishing across to the far bank feeding micro’s with an expander on the hook to catch F1’s to 2lb steadily from the off whilst preparing his edge swim with micro’s for later. When his far bank swim dried up, he switched to his edge line to continue catching F1’s and odd carp up to 4lb to finish the match with 127lbs 7ozs. Andy not only qualifies for this year’s big money final at Maver Hayfield Lakes, but also qualifies for this year’s Maver British Pole Championship as well. Second place on the day, and also drawn on Covey 5, next to the winner on Peg 115, was local man Mark Tregear. The Warrington-based rod opted to fish micro’s and pellet short at top 2 plus 2 to find F1’s and Carp to 5lb in numbers for a total weight of 121lbs 9ozs. Mark also qualifies for this year’s British Pole Championship final later in the year. Finishing in third place on the day and taking the last of the automatic British Pole Championship qualification places was venue regular, Chris Weeder JNR, (Preston North West). Drawn on peg 155 on Covey 6, Chris opted to fish hard pellet and then maggot shallow to finish with F1’s and Carp to 6lb for a final weight of 119lbs 7ozs to confirm a lake win. 6th Stuart Carroll (Leigh Tackle & Bait), Peg 34 (Covey 2), 90-07-00.